Fundamentals are what drives the FX Market, and just about ever other financial market on the face of the earth. The Volta PAMM has returned to the basics of trading, hunting for trade entries around news releases where it perceives, based on a wide swath of technical information, if and when the market has priced the news 'incorrectly'. 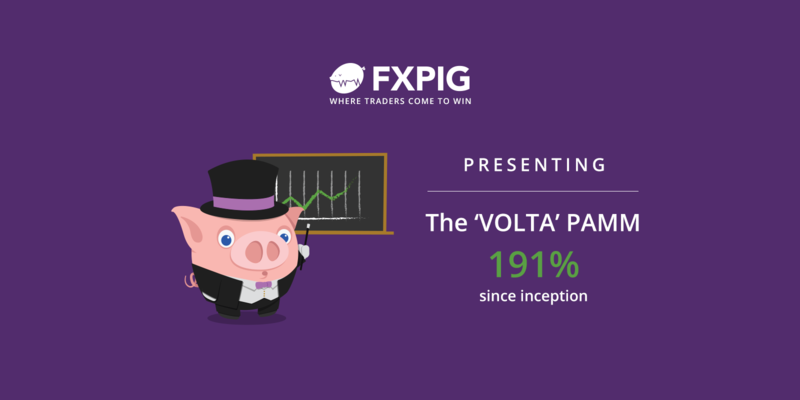 With an already robust one year PROFITABLE and PROVEN track record, the Volta PAMM is available in two distinct risk configurations, with a targeted annual performance of 40-120% and maximum hard-stop per trading day of 4% on the lower risk tier and targeted annual performance of 120-360% with maximum hard stop loss of 12% on the higher tier. Nevertheless, we want to make it a point to remind you that hard stops are stop loss orders which are executed at market and are susceptible to slippage, which could lead to larger than expected losses. In reality, it should be known that when granting trading privileges via an LPOA to a money manager one has to assume that all the available capital is potentially at risk. As always, should you have any questions, do not hesitate to contact our dedicated support team at support@fxpig.com or by submitting a support ticket via the MyFXPIG Client Portal. Find out more information on our other featured PAMM accounts here.